Current view of Terezin fortress from the south east. The header of this page uses the fragment of notes for the lecture On the Border of Science and Medicine, by Karel Fleischmann. THE UOA SECOND EDITION IS NOW AVAILABLE! Elena Makarova, Sergei Makarov & Victor Kuperman. University Over The Abyss. The story behind 520 lecturers and 2,430 lectures in KZ Theresienstadt 1942-1944. Second edition. Verba Publishers Ltd. Jerusalem, Israel, 2004. Hard-cover. 560 pp., 320 illustrations. ISBN 965-424-049-1. The volume put together by Elena Makarova, Sergei Makarov and Victor Kuperman is a great memorial to a lost culture: basically, the Central European Jewish culture destroyed by National-Socialist Germany. The 2nd edition has been reedited, corrected and extended by reactions and new inputs of the readers; a new chapter, The Laughter of the Helpless, has been written, about ingenious humor and satire of the prisoners. It was also redesigned which made reading easier. Terezin Walking Scenario is an imaginary tour of the ghetto in the Fall 1943 based on a manuscript by prisoner Hugo Friedmann (a novelette by Elena Makarova). Free Time in Prison is an overview of the entire lecturing system at the ghetto, including groups and fields, like music, art, etc. The portraits of some lecturers are given in passing. To Sketch the Contour of the Shadow consists of 18 complete stories of outstanding lecturers who perished. Voices and Faces includes eleven Elena’s interviews with survivors who either lectured or attended lectures. Lexicon lists titles of 2430 lectures, and short biographies for each of the 520 lecturers. "It is great here, so many interesting people. One could live here quite decently, if not for the constant fear of being sent to the East" -- Friedl Dicker-Brandeis, artist, designer, art teacher, and Holocaust martyr, wrote in a postcard sent from Ghetto Theresienstadt, in 1943. Theresienstadt (Terezin), an 18th century fortress near Prague, was converted by the Nazis into a transit point, where deported Jews were interned, sometimes as long as two years, and then sent to the extermination camps. The prisoners were mainly professional people from Czechoslovakia, Germany, Austria, Holland and Denmark, many of them a part of the European cultural elite. But the cliched image of a 'pitiful Jew', crushed by a 'demonic force', didn’t hold in Terezin. Despite miserable conditions and numerous deaths from starvation and diseases, the prisoners never gave in. In this surrealistic world on the edge of life and death, exhausted by hunger and severe conditions, they stubbornly clung to their cultural values - books, art, music, intellectual debate, humor and irony. Volumes have been written about the culture in Theresienstadt. Inspired operas and musical pieces that originated there are widely performed. Drawings by children and adult artists, camp magazines and poems have been published. The children in Terezin were educated and cared for by excellent teachers and social workers. They regained their will to live and hope for the future, but, with few exceptions, were ruthlessly exterminated. In addition to that, hundreds of professionals and academics gave thousands of lectures on all imaginable cultural and scientific subjects. In the documents that survived the war, many of them explain the main motivation for this work - first, to prepare and educate the youth for the post-war life; and second - to revive their own professional self-esteem and replace the misery of physical existence with the richness of spiritual life. Lectures substituted teaching forbidden by the Nazis. Delivered in scattered miserable attics and cellars, however cold or hot the weather, the lectures took the shape of full courses in history, philosophy, art, literature, medicine, science, Judaism and other fields. They attracted tens of thousands of young people and adults, hungry and exhausted after their day’s work - the triumph of human dignity and integrity in the face of death. The inmates had to report to the Nazis of all cultural activities that took place in the camp. Ironically, the survived reports proved a precious source to recover data for thousands of lectures - including their titles, time and locations. Some of the speakers were well-known before the war in their own right, for example, Dr. Leo Baeck, Chief Rabbi of Germany, Alfred Meissner, Minister of Masaryk Government in Czechoslovakia, and composer Viktor Ullmann. Others survived the Holocaust and found wider recognition afterwards, like psychologist Viktor Frankl, historian Miroslav Karny, writer Josef Bor (Bondy), and author Norbert Fried. But the majority perished. Their careers stopped short, together with their lives; they were simply forgotten. They were such fascinating people as the Jewish philosopher Jehuda Palache, the psychologist Max Brahn, the art historian Max Bohm, the classical philologist Maximillian Adler, the psychologist Gertrude Boeml, the art collector Hugo Friedmann, the journalist Philipp Manes, and the semitologist Moizis Woskin. Our independent research group Elena Makarova Initiatives has undertaken to collect all dispersed information about Terezin lectures and lecturers stored in the archives and libraries of Europe, Israel and the US. The result of this work is a computer database with 520 names and 2430 lecture titles, supported by volumes of related documents and copies. As far as we know, it is the most comprehensive collection ever compiled. You may find the list of the lecturers in Terezin on the next page. The records for every lecturer include the titles of the lectures he or she delivered, and linked documents. We have also recorded the time and location of about 75% of the lectures. The texts and listeners’ notes are available for over 80 lectures. Additional information includes general data and visual material on ghetto/transit camp Theresienstadt, on the Jews’ own committee (FZG, 'Free Time Organization') that regulated the inmates’ spare time, and on other cultural and spiritual activities in Terezin. The purpose of this on-line publication is to bring to the public’s attention the information we have collected. For more details on any particular person on our list, please read University Over the Abyss described below--or contact us. We have done our utmost to ensure that our research is accurate. However it may contain some errors. We would be grateful for any comments and additions to our list. University Over The Abyss (UOA). It combines vivid stories about the ghetto, its inmates and intellectual life, with strict historical and statistical data. Since University Over The Abyss came into being, the authors suddenly found themselves amidst seething public debate. To some, showing the “optimistic side” of the Holocaust looked almost blasphemous, while the others hailed the issue of the unarmed, intellectual resistance and saving dignity (if not life) as very important and instructive. …I got both of your works, the book [University Over The Abyss] and the magazin [2001 Magazine-catalogue about theater in KZ Terezin]. It is very, very interesting, both. I kept reading 2 nights. It’s also helpful – you see Ther. [esienstadt] from a special angle – and it gives you some additional – better feelings about the past. …We learned so many new things about the life in Terezin - it is like if we had been one of the proverbial blind men trying to describe an elephant. We knew nothing about the Manes group, the Talmudkommando, did not even know about the existence of "Shalom on Friday" [humor magazine] and of dozens of other activities which you have so skillfully recorded. NB: Both Arnost Lustig and Jan and Eva Roceks are survivors of Terezin and other camps. 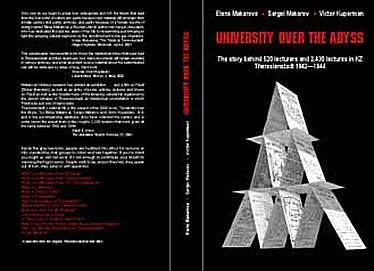 Linked Projects: Czech edition of University Over The Abyss appeared in Prague in 2002 (G+G Publishers). A Russian series of four Terezin history volumes has been published in 2003 - 2008. The first volume, The Fortress of Deceit: Terezin Diaries1942-1945, has been issued in 2003 (408pp., Bridges of Culture, Moscow/Jerusalem); the next volume I Am a Wandering Child: Life, Literary and Art of Terezin Children appeared in July 2005. The last volumes, Terezin Lectures, and Art Against Destruction: Theater, Music and Visual Arts in Terezin 1942-1945 appeared in 2005 and 2008 respectively. Czech edition of I Am a Wandering Child ( Pevnost nad propastí. Já, děcko bloudící?, Bergman, Praha, 540 pp. ) was published 2009 . The authors will be thankful for every comment and/or additional information which may be included in the books. Leo Baeck Institute, Jerusalem; Terezin Initiative Association, Prague; Simon Wiesenthal Center, LA; Rich Foundation, the USA; Academy of Science and Humanities, Israel; Memorial Foundation for Jewish Culture, USA; Felix Posen Foundation, Switzerland; Hanadiv Charitable Foundation, Britain; Conference on Jewish Material Claims Against Germany, USA; William Gross, Israel; Pär Stenberg, Sweden; Prof. Edith Kramer, USA, and other donors.